Catching your own minnows saves money, but requires patience. 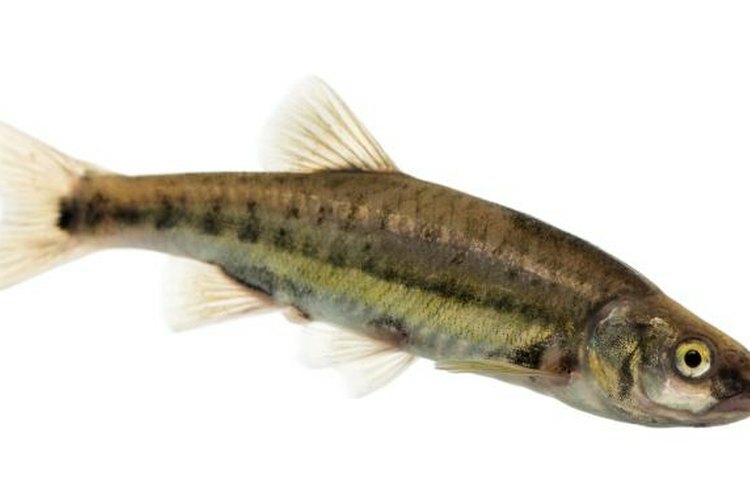 To bait a minnow trap, you need only place a small amount of food inside. The odor of the bait will travel downstream, hopefully tempting minnows to search for the source. Most minnow traps feature a funnel that allows the fish to enter the trap as they search for the food source. Once inside, the fish rarely find their way back out. A variety of baits work well for attracting minnows, including dog food, cat food, hot dogs, bread and bacon. You can simply let the bait drift about inside the trap, but you will have better results by suspending the bait directly in the middle of the trap. Place loose items like dog food in a small mesh bag or piece of pantyhose. Bacon and similar baits can be suspended in the middle of the trap with a piece of string. Minnow traps may catch a variety of other animals as well. Traps baited with a meat-based bait and set overnight often catch crayfish. Additionally, you may catch small catfish, tadpoles or even snakes. Accordingly, it is wise to exercise caution when opening a minnow trap.